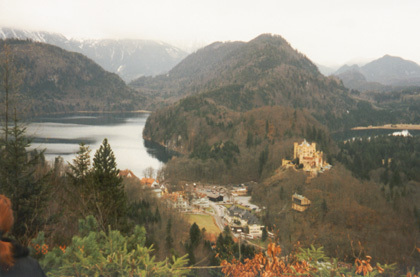 King Ludwig II of Bavaria tried to build several castles in Bavaria. He only completed one (Linderhof), and unfortunately, it’s the only one which I don’t have any information on (yet). Go figure. Send your questions or comments to Thanks! King Ludwig II laid the foundation for Neuschwanstein on September 5, 1869. It was built over the ruins of an older castle. The management of the construction was given to Eduard Riedel. Work continued until Ludwig’s death in June 1886. The main motif of the castle is the swan (schwan), Ludwig’s favorite creature. You can find swans in the drapes, door handles, paintings, and so on in the castle. There are also many paintings depicting Richard Wagner’s operas, which Ludwig enjoyed. (As an added bonus, one of Wagner’s operas, Lohengrin, had a swan in it.) 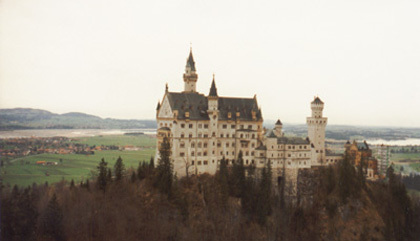 After 1884, Ludwig spent about a quarter of his time in Neuschwanstein. Although incomplete, the castle was was opened to the public a few weeks after Ludwig’s death. Today, it’s pretty commercialized, but I’m still amazed by the know-how of the builders of the past. If nothing else, it makes a great location for taking pictures. Neuschwanstein is located in the southern part of Bavaria, near the town of Füssen, just north of Austria. It’s about an hour and a half from Munich by car. You can get there from Munich by taking the autobahn A96 towards Stuttgart. About half an hour west of Munich, you can exit at Landsberg and head south towards Füssen on Highway 17. From Landsberg it’s about a 45 minute drive. You can actually see this castle from Highway 17 -- it’ll be on the left. The sign for the castle says “Konigen Schloss” (King’s Castles), or something like that. Once you turn off Highway 17, you’ll reach a little village after a couple of kilometers. You can park in the public parking lots there (I don’t know the rates). To get to Neuschwanstein, you can either use the local horse and carriage service (4 DM), or climb up yourself. The climb is pretty steep, though. Just remember -- I warned you. I didn’t see a sign indicating where the path to the castle was, but if you start walking from the parking lots toward the castle, you should either find the path, or run into people that know where it is. It costs 11 DM for a tour of the castle. There are English tours which last about 30 minutes. Try to come way before closing time, as they either stop selling tickets at some point, or run out. I keep just missing tours because of this reason. The “other” castle of Schwangau -- Schloß (palace) Hohenschwangau as seen from Neuschwanstein. Ludwig merely restored this castle. Or maybe he used to live in it. I’m not sure. The lake to the left is the Alpsee, or Alp Lake. (Please don’t ask me the lake’s volume in liters.) There are English tours available here as well, but not as often as Neuschwanstein. This may be a problem if you come during the off-season. Unlike Neuschwanstein, Hohenschangau is completely finished and has that lived-in castle feel to it. King Ludwig II built Herrenchiemsee as a tribute to the Sun King, King Louie XIV of France. It is built on the island Herren on the Chiemsee (Chiem Lake). Construction began on May 21, 1878, some time after Ludwig bought the island. He had the architect Georg Dollmann replicate as much as possible the Versailles in France. 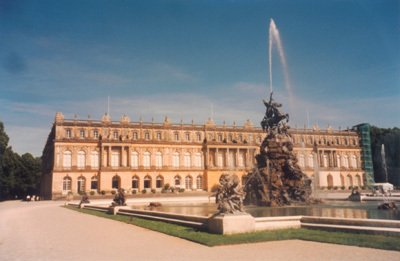 As an example, the garden façade of Herrenchiemsee is an exact copy of the garden façade of Versailles. The layout of the palace inside is also the same as Versailles. There is even a Great Gallery of Mirrors in Herrenchiemsee. Most of the paintings and murals of the castle depict the life of Louie the XIV. Interestingly, there are no portrait of King Ludwig anywhere in the palace. As with Neuschwanstein, construction stopped with the death of Ludwig. The cost for the boat ride from here was 11 DM (there and back), payable to the boat captain. The ride is about 30 minutes. On the island, you can walk to the castle, or take a horse and carriage (4 DM each way, 15 minutes). The tours for the castle are 8 DM. English tours begin at the top of every hour. Check the times for the last tour, however. I think it’s at 4:00 pm. The tours last about 45 minutes. There is a museum at the palace for Ludwig. Be sure to check what time the last boat leaves the island.